1. The sun is your friend. Most of the time, even with the ickiest baby poop, my diapers would come out of the wash looking brand new (having a sprayer helps, I think). 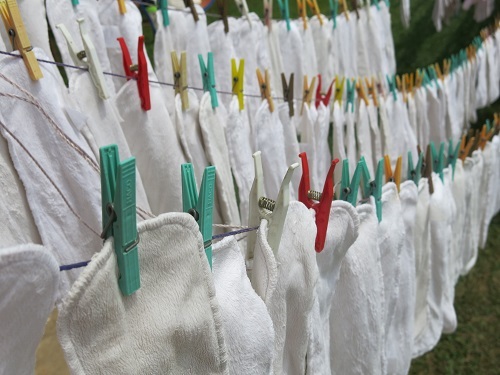 But, if your diapers come out of the washer looking less than perfect, just hang them up outside and let the sun do its thing. Seriously, the sun will bleach the stains right out of your diapers! 2. You might have the wrong type of washing machine. It’s true, you can wash cloth diapers in a high efficiency front loader, but you’re more apt to have issues with detergent build-up, ammonia stink, and other fun things. A good, ‘ol top loader works best – more water = cleaner diapers. If you have a front loader, fear not – here are some tips for you. 3. You may need to rethink Junior’s wardrobe. There are few things cuter than a fluffy, cloth diapered baby booty – but that also means that said booty might not fit into clothing that is otherwise the right size. Instead of stiff jeans, go for jeggings, which have some stretch. Additionally, pick up a couple onesie extenders too! On the plus size, if you have a little lady, a colorful cloth diaper looks extra cute under a dress! 4. Always use the same diaper at the doc’s. If your babe is in a disposable diaper for their very first weight check at the pediatrician’s office (and, they probably will be, since most babies won’t fit into one size cloth diapers right away), make sure that they are in a disposable diaper each time they are weighed. Cloth diapers can add a decent amount of weight to the scale, and you want to have the most accurate reading (this is especially true if your baby is being weighed more often than normal). 5. Watch out for those diaper creams! Cloth can be a very gentle option for your baby’s bum, but if your baby has very sensitive skin, a diaper rash can be a pain to treat. Unfortunately, there aren’t very many diaper rash creams that are cloth diaper friendly and, in my experience, the ones that are aren’t that effective. It makes sense if you think about it – many rash treatments are barrier creams and a waterproof cream on your diapers means that they will start repelling liquid instead of absorbing it. You have some options though – you can use disposables with some heavy duty cream, or use fleece liners with your cloth diapers. The fleece protects your diaper from the rash creams! Other than the diaper cream tip, I actually haven’t heard these before – cheers!